Wallace and Dr. Rockwood were joined in the research by Drs. Olga Theou, Judith Godin and Melissa Andrew of Dalhousie and Dr. David Bennett of Rush University in Chicago. Wallace — who is in year four of a five-year interdisciplinary PhD — is a member of Dalhousie’s Public Scholars Program. Public Scholars actively engage in community outreach by giving talks in non-academic settings, sharing their ideas through social media and writing for mainstream publications. They also actively engage with the media by providing expertise and opinions to raise awareness of issues that matter and that help the public make sense of current events. Wallace analyzed autopsy and clinical data from 456 subjects in Rush University’s Memory and Aging Project, a long-term cohort study of people in a retirement community. She and Dr. Rockwood applied the frailty index (created by Dr. Rockwood and colleagues at Dalhousie) to the cohort to complete their analysis. Their results suggest that frailty aggravates the neuropathological effects of plaques and tangles — jumbled strands of proteins that accumulate in some people’s brains — and may even be an independent risk factor with nothing to do with plaques and tangles. At the same time, resilience may be the most important protective factor against Alzheimer’s disease and dementia. In Dr. Rockwood’s view, health researchers and decision-makers should be identifying pivotal opportunities for preventing frailty and dementia, and taking action to do just that. He sees delirium is a key target. Delirium often goes unrecognized and untreated. This is why Dr. Rockwood insists researchers and providers need to look more closely at what’s being done now and design interventions that screen for risk and target frailty to prevent delirium and downstream cognitive decline and/or dementia. Seniors’ housing facilities offer another key opportunity to promote the behaviors that are useful in preventing frailty and therefore dementia—such as social interaction, physical activity and healthy eating. 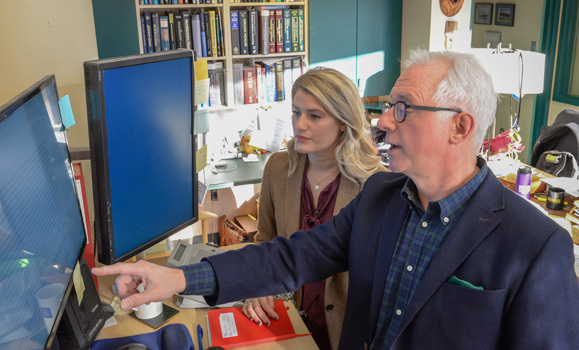 “My interest is in finding ways we can control the burden of dementia now,” says Wallace, who worked as a research assistant with Dr. Rockwood for two years after receiving her undergrad in psychology from Dalhousie. She went on to complete a masters in neuroimaging at McGill University, before returning to Halifax to pursue doctoral studies with Dr. Rockwood. She plans to probe the Rush study’s data further in the final year of her PhD, to gain a greater understanding of how frailty relates to the development of dementia symptoms over time. Read the full study in The Lancet Neurology.